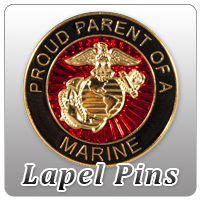 Marine Corps Lapel Pins from the EGA Shop, where every purchase supports our troops! Celebrate America's Birthday with these patriotic red, white, and blue Marine Corps designs! Memorial Day t-shirts and accessories for families of Marines and military. 5/8 inch retro style American Flag.